The Easter festival is being celebrated by Christians in memory of the death and resurrection of Jesus Christ, usually during a 40-day fasting period. It’s called the rebirth of Christianity. The exact date of the festivities is not fixed. However, it is still celebrated every first full moon Sunday after March 21 or in between March 21 and April 25. There are many controversies around the traditional eastern festival. The first evidence of this controversy dates back to the 2nd century. In the 4th century the majority of the devotees were no longer happy observing the Hebrew calendar during the holy festival. It was commonly regarded as an offense to the tradition to consult the Jews about the right time to celebrate the commemoration. However, it was has been reconciled when the First Council decided that the date for the celebration will be calculated independently. Since then, the official date for the Lenten season is on the first full moon Sunday after March 21 of the calendar. The term Easter comes from Eastre, an Anglo-Saxon goddess that represents hare and egg. 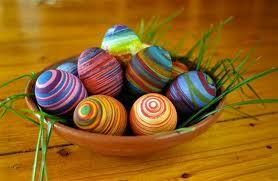 The specific name of Easter egg painting is called Pysanka. The word comes from Ukraine, which is the verb pysaty which means “to write”, since the designs were not painted on the Easter eggs but written or decorated with the use of beeswax. Easter egg-throwing was held in the church during medieval period. It was started by a priest who does the first throwing of a hard-boiled egg to one of the boy church’s choir. Then it will be tossed to the other one and to the next and so on. When the clock struck at exactly 12 o’clock, whoever holds the egg will be the winner and will keep the Easter egg. The traditional giving of eggs during Easter festival dates back to the Egyptians, Persians, Gauls, Romans and Greeks where it is believed that an egg symbolizes life. American households buy Easter eggs at about $131 each year while consume more than 16 million jellybeans which is enough to round the globe thrice during Easter festival. In the White House, former President Rutherford B. Hayes in 1878 started to accommodate Easter Egg Roll activity in front of its lawn every year. Tosca Italian Trattoria is the holder of the prestigious Guinness World record for the tallest chocolate Easter egg which measures 34 feet and 1.05 inch tall and weighed 7, 200 kg or 15, 873 lbs 4.48 oz at Cortenuova, Italy last April 16, 2011.